Federal Reserve Chairman Jerome Powell’s speech on Wednesday did something few things have been able to do in recent months: Energize bulls—at least for a day. Then there’s what the market itself said about the speech. 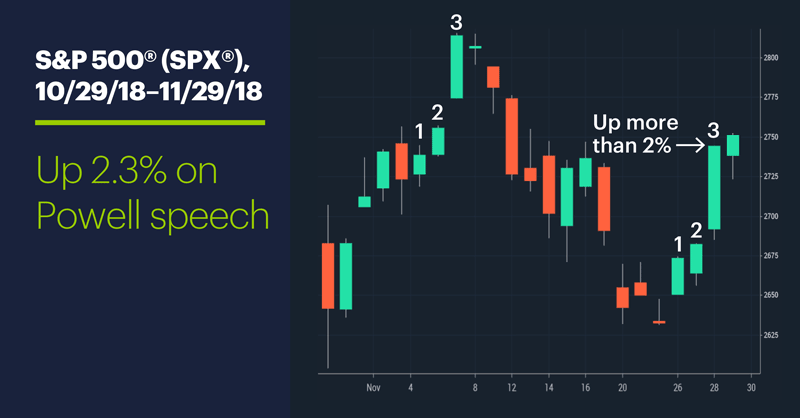 Wednesday’s price action amounted to an immediate thumbs up and apparent endorsement of the dove thesis, with the S&P 500 (SPX) notching its third-straight up day and gaining 2.3%—its biggest up day since March 26. Yesterday stocks walked back some of their gains in early trading—the market deciding it may have overreacted? ●After five days, the index’s average gain/loss was 0.25%—better than its overall average five-day return of 0.16%. ●After five days, the index’s average gain/loss was -0.04%. In fact, the SPX underperformed its historical averages in the first eight days after these three-day moves. The takeaway: In many cases, the market will take a breather or reverse course after this type of surge. The chart also shows the SPX made a similar move earlier in November, peaking at the swing high on November 7. And while the chart reflects only the market action as of 3 p.m. ET, yesterday was on track to be a relatively narrow-range day, although the SPX rallied to a higher high after the release of the FOMC minutes. 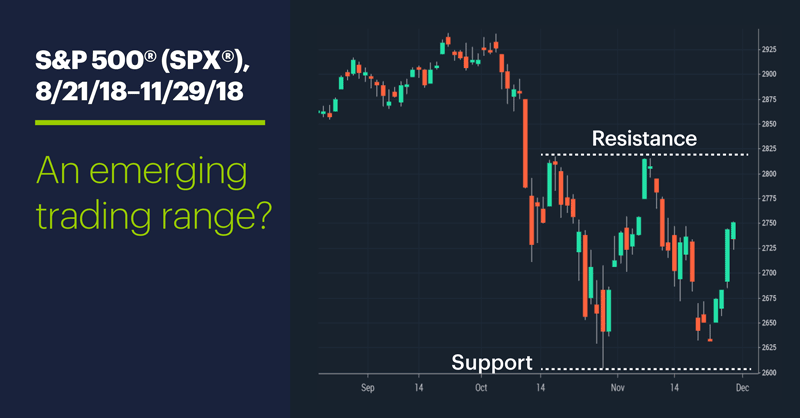 Stepping back a little more, the following chart above shows the SPX is a little above the halfway point of what some traders may be seeing as a possible broad trading range, with resistance around the October-November swing highs and support at the swing lows. The outcome of this weekend’s US–China trade pow-wow may go a long way toward determining which level it tests first. Market Mover Update: Yesterday crude oil futures dropped below $50/barrel for the first time since early October 2017 before rebounding. January WTI crude oil futures (CLF9) traded as low as $49.41, but reversed to go up more than 3% on the day and push back above $52. Today’s numbers (all times ET): Chicago PMI (9:45 a.m.), European Union Unemployment Rate. Today’s earnings include: Big Lots (BIG). 1 MarketWatch. Why economists insist Powell wasn’t as dovish as market thinks. 11/29/18. The S&P 500 Index is a market capitalization-weighted index of 500 widely held stocks often used as a proxy for the US stock market. It is not possible to invest in an index. The material is being provided to you for educational purposes only. The content has been written by, and will be presented by, a third party not affiliated with E*TRADE Financial Corporation or any of its direct or indirect subsidiaries (E*TRADE). E*TRADE is not responsible for the content. No information presented constitutes a recommendation by E*TRADE to buy, sell, or hold any security, financial product, or instrument discussed therein or to engage in any specific investment strategy.